It’s such a treat to nibble on raw cookie dough! This version is 100% safe to eat. It’s made with no eggs and no raw flour, so go ahead and indulge! We’ve all done it. No shame! Eating cookie dough is one of life’s greatest pleasures. It’s so indulgent! I know a lot of people that like eating cookie dough even better than eating cookies! It’s especially great at this time of year, when the weather is way too hot to even think about turning the oven on to bake dessert. With this recipe, you can indulge that craving all you want. It’s perfectly safe to eat and so delicious! I’ll be honest, I taste raw cookie dough all the time. I’m not too squeamish about it and so far I’ve been lucky and have never gotten sick. But the truth is, it’s risky. There are two things you need to watch out for: raw eggs and raw flour. There is a small chance (about 0.012%) that raw eggs could be contaminated with Salmonella bacteria, so if you are very young, very old, pregnant, or if your immune system is just not at its best, you should probably avoid eating raw eggs, just to be safe. And raw flour could also be contaminated with bacteria such as E coli. 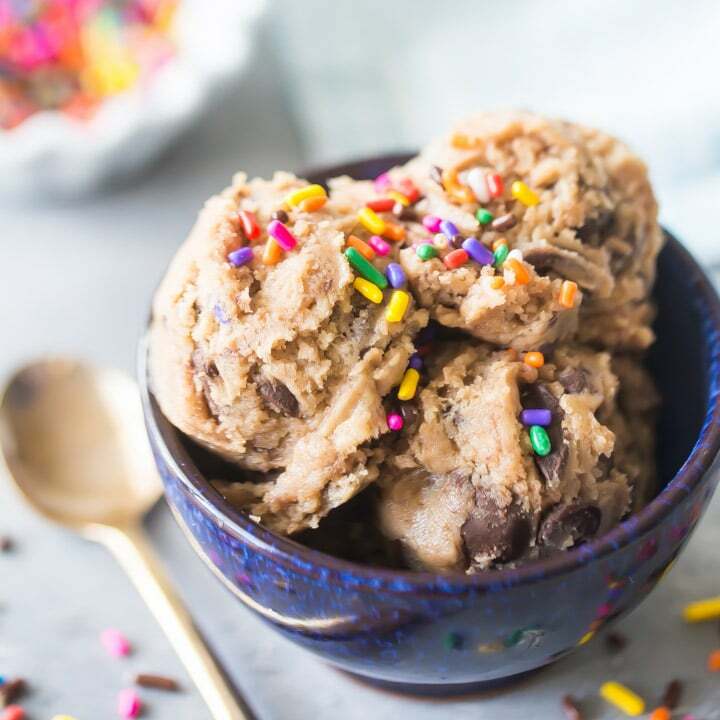 So, if you want to enjoy eating cookie dough without any fear, this is the recipe for you! It’s made with no eggs and no raw flour. You can indulge all you want, because it’s perfectly safe to eat. 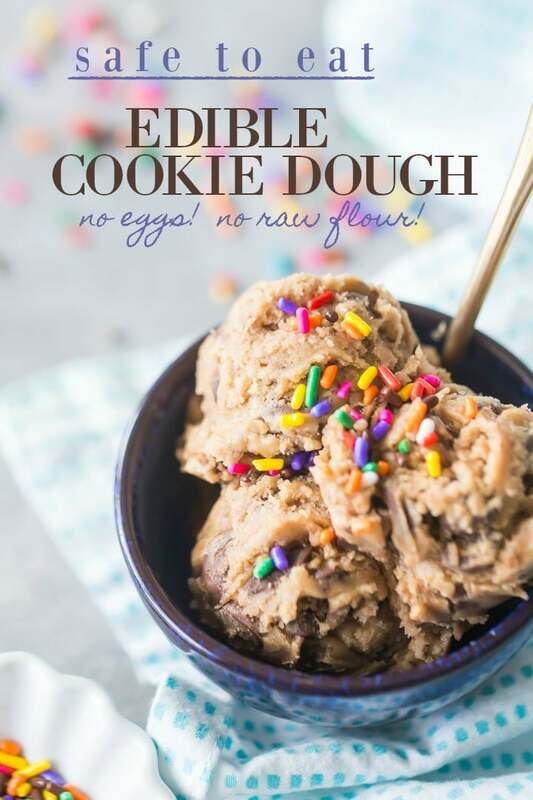 This edible cookie dough recipe is really easy to make, and it only takes about 10 minutes! Start by spreading the flour onto a baking sheet. Bake it in the oven for 5 to 10 minutes, to kill any harmful bacteria. While that’s going, cream the butter, sugars, and salt together until fluffy. This takes about 5 minutes with the mixer on medium-high speed. Add in the milk and vanilla, stirring until smooth. Once the flour has cooled a bit, stir that in. Finally, fold in the chocolate chips. And you are good to go! Start snacking! 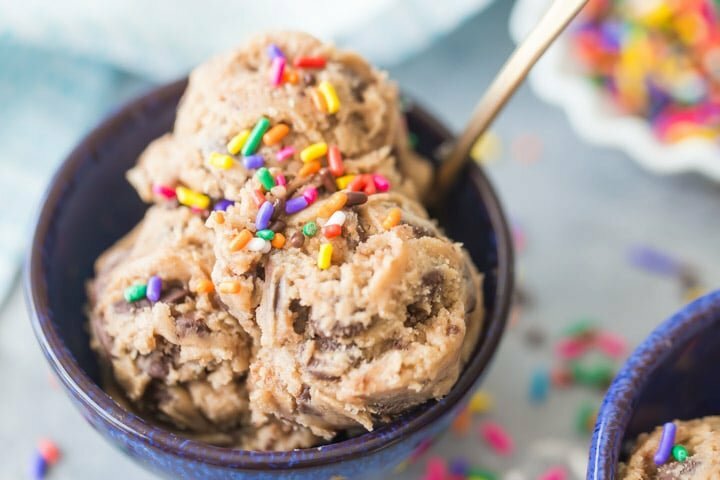 SHOULD EDIBLE COOKIE DOUGH BE REFRIGERATED? If you don’t finish eating the whole batch of edible cookie dough in one sitting, it’s probably a good idea to keep it refrigerated, just because of all the dairy it contains. As it chills, it becomes quite stiff. You can gently rewarm it (about 10 seconds in the microwave), just let it sit at room temperature for 15 minutes or so, or scoop it out of the container as is and enjoy. It will pretty much melt in your mouth anyway! CAN EDIBLE COOKIE DOUGH BE BAKED? Because this recipe contains no eggs or leavening, it won’t bake up like a regular cookie would. It's such a treat to nibble on raw cookie dough! This version is 100% safe to eat. It's made with no eggs and no raw flour, so go ahead and indulge! Preheat the oven to 350 degrees F, and spread the flour onto a baking sheet in an even layer. Toast the flour in the oven for 5 to 10 minutes. Cream the butter, brown sugar, sugar, and salt together in a large bowl on medium-high speed until pale and fluffy (3 to 5 minutes). Stir in the milk and vanilla. Mix in the flour until blended. Can i use coconut flour in this recipe? Hey Julia! I haven’t tried that, but I’d imagine it should work. If you give it a try, would you loop back and let me know you liked it? Thanks! Such a delicious treat! I love eating cookie dough! 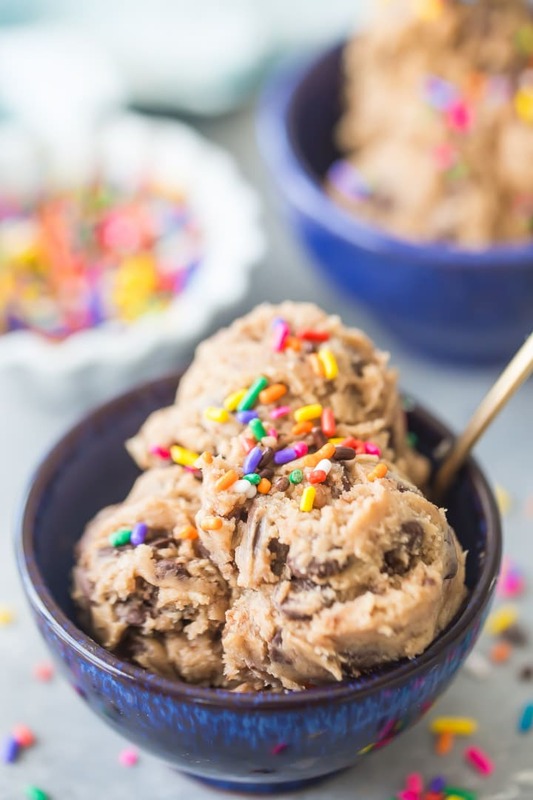 Well if anyone is going to have delicious cookie dough, you are going to be that person! If I make this I was thinking of using it as a middle layer of a cake. I would spread it in between the layers instead of frosting. Would I have to refrigerate the cake? I’m not a fan of cold cakes so i was wondering if it was necessary. Sounds delicious! Hi Christine! How long were you thinking you’d want to leave it out at room temperature? I would not leave it out any longer than you would leave out a glass of milk. This recipe is unbaked and it contains dairy, so it could spoil rather quickly. Oh ok, thank you. I usually leave a cake on the countertop unless it has cream of some kind in it. I will keep it in the fridge and cut my piece to leave out for a bit to get the chill out of it. Looking forward to trying it! This looks like the perfect addition to mix in some homemade ice cream! Haha yes! That will definitely be happening here sometime soon! Hey there! I would be hesitant to add it while it’s warm because it could melt the butter. Room temperature/cool would be best! Hi Deanna! That should work just fine. Have fun and enjoy! About 3 to 4 tablespoons. Why were there no measurements? The measurements are in the recipe card at the bottom of the post. Wondering if maybe your browser is out of date? I’m seeing it all there on Chrome and on Safari…? 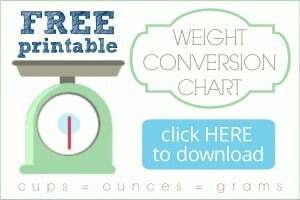 There are tons of cookie recipes on this site! I would just refer to one of those if you’re in a baking mood. The soft chocolate chip cookies are a favorite, you can find them by typing “Soft Chocolate Chip Cookies” into the search window at the top. Or you can just click the “Cookies” category on my “Bake” page, and browse all the different options. Very yummy! Made a large quantity…wondering if it can be frozen?